Ball So Hard’s latest series “Can we fix it” analyses some of the NBA’s worst teams for signs of hope or helplessness. Is your favourite team flailing at the foot of the league standings? Let’s see if we can fix it! 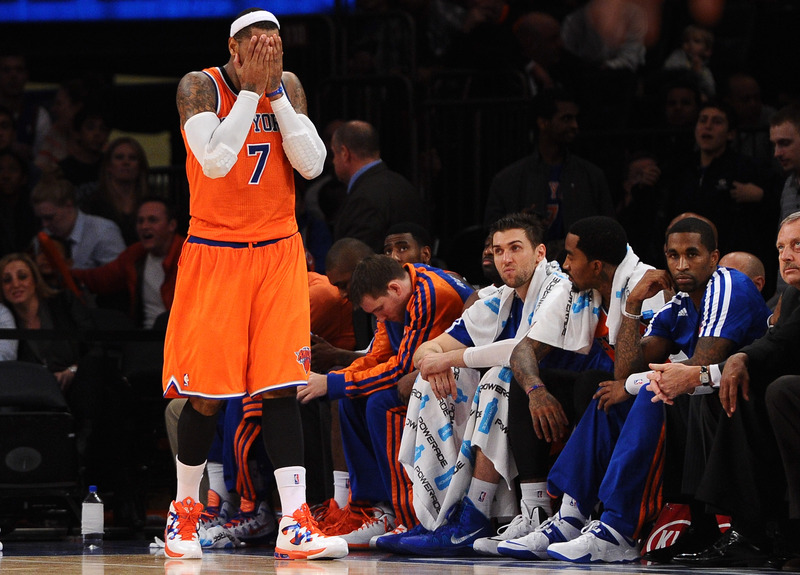 It has been a season to forget for Carmelo Anthony and the Knicks this year. One of the few things New York have going for them is Carmelo Anthony. There aren’t many bigger stars in the league than Melo, and his presence in New York is the Knicks’ biggest asset heading forward. One of the purest scorers in the league – Carmelo is one of only three current players with a 60+ scoring night in his belt – Anthony has many of the desirable traits that any front office would want to build a title tilt around. He has the accolades to attract high-end free agents (seven All-Star selections and six All-NBA team nominations) and the offensive prowess (2012-13 scoring champion) to be a key cog on a championship team. Sure, his defensive abilities leave something to be desired, but Dirk Nowitzki and Paul Pierce were never outstanding defenders. Surround Carmelo with the right teammates, and New York could be a serious contender. After Anthony, the level of talent drops off significantly. Tyson Chandler was an All-Star last season and Amar’e Stoudemire got the nod in 2010-11, but both have been hampered by injuries since their lone appearances as Knicks. Meanwhile, it may have only been less than a year since JR Smith was named the league’s Sixth Man of the Year, but it must feel like a lifetime to Knicks’ fans after the roller coaster ride he has put them through this season. Rating: 10/15 – the talent might dry up quickly after Anthony, but he is one of the game’s biggest names. C’mon now, it’s New York! The Knicks have a huge advantage in the free agent market based purely on their location. Who wouldn’t want to play 41 games each season at the Mecca of basketball, the Madison Square Garden, with stars like Spike Lee and Woody Allen sitting in the front row? Rating: 5/5 – despite the recent gloom of despair, New York is still one of the premiere locations to play in the NBA. 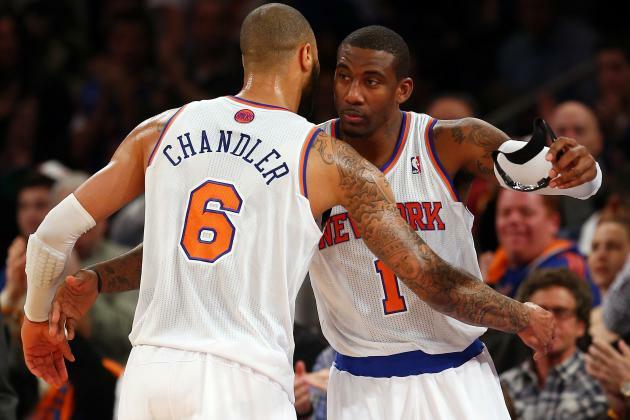 Tyson Chandler (left) and Amar’e Stoudemire (right) are the only other Knicks to be selected to the All-Star game during the Carmelo Anthony era. Unfortunately for Knicks’ fans, no matter how bad their team is this year, their performance won’t earn them a juicy pick in this year’s lauded draft class. The Knicks handed their 2014 first and second round picks to Denver in order to pry Anthony from the Nuggets. In what was a seemingly no-brainer decision in 2011, the Knicks have handcuffed themselves to their current roster at the worst possible time. It gets worse, too. Over the next three seasons, New York will give up two more first round picks (to Denver and Toronto in 2016) and five second round picks (Denver and Houston in 2014, Houston 2015, Sacramento 2016, and Toronto 2017). Not exactly the best position for a team shackled to several max contracts for the next two years to be in. The Knicks are owed Sacramento’s second round pick this season, provided it doesn’t fall in the 31-55 range – but somehow it seems unlikely the Kings will be catching the likes of the Heat or Clippers in the standings any time soon. Sorry New York. Rating: 0/10 – one first round pick in the next three years isn’t the best way to kickstart a rebuild. Mike Woodson has a winning record with the Knicks, but that doesn’t mean he isn’t in the hot seat. 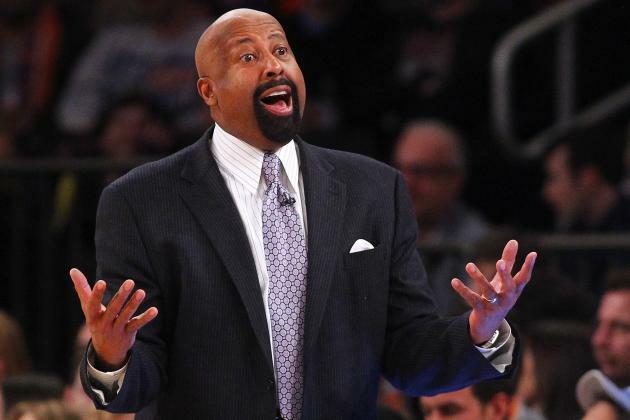 There aren’t many coaches more often placed on the chopping block than Mike Woodson. New York is one of the biggest markets in the NBA, and their rabid fan base and constant media scrutiny is often quick to point the finger at the men on the sidelines. Woodson has a 99-74 record in his time with the Knicks, but that winning record counts for little in the championship deprived New York market. Meanwhile, Anthony recently told the Daily News that the Knicks off-court issues will factor into his free agency decision this offseason. “A lot of things (are) going to be thought about when that time comes,” Anthony responded when queried about his thought process surrounding signing a new contract. There have been several notable off-court issues under Woodson’s watch over the past three years. Most notably, Smith was suspended by the league for violating their anti-drugs policy, while point guard Raymond Felton is currently facing felony charges for firearms offences. If it is deemed Woodson can’t control his locker room – something which could turn away New York’s prized forward – his time in New York could be coming to an end. 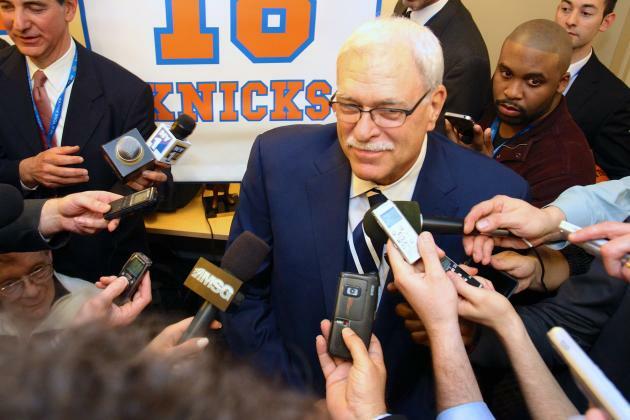 The signing of Phil Jackson could put Mike Woodson’s job security in doubt. Adding extra weight to Woodson’s shoulders is the Knicks signing of 11-time champion coach Phil Jackson as their new president of basketball operations. Jackson has stated several times that he no longer wishes to coach in the NBA, but that didn’t stop Lakers fans from pining for him to return to the sidelines in recent years. And having such an accomplished colleague standing behind him can only cast a shadow over every move Woodson makes. Rating: 2/5 – even Woodson’s winning record in New York wont be able to save him from the media storm and fan outrage another losing season would bring. 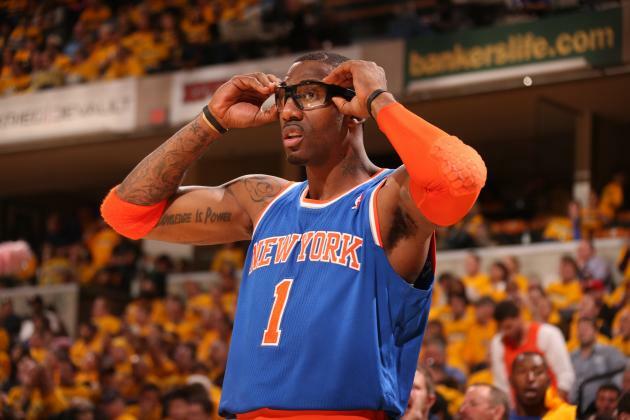 Amar’e Stoudemire was supposed to be New York’s saviour, but his expensive contact has come back to haunt them. The two most important assets for a rebuilding NBA franchise to have are draft picks and cap space. We’ve already covered the hole New York has dug themselves after dealing away a ridiculous amount of future draft picks over the past few years, but how does their salary cap situation look? Sorry Knicks fans, it isn’t pretty. Next season, thanks to the monster contracts of Stoudemire, Chandler and Andrea Bargnani, New York has $67,686,515 in committed salary on the books. And that’s before factoring the chance Anthony decides to re-sign in New York. If Anthony takes up his player option for next season, it pushes New York’s salary over the $91 million mark. But with Anthony expected to opt out and pursue a max extension (worth $129 million over five years under the new collective bargaining agreement), that number can only increase. Stoudemire makes over $23.4 million next season, Chandler $14.6 million, and Bargnani $12 million, accounting for over 80% of New York’s projected salary cap for 2014-15 between the three of them. Anthony’s extension alone would push them extremely close, if not over, the projected tax threshold of $75.7 million. And that still only gives them four players! 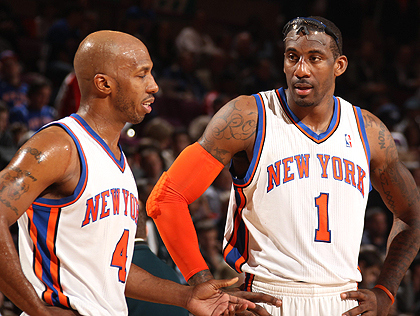 The Knicks saved $14.2 million amnestying Chauncey Billups (left) when they could have saved over $80 by waiving Amar’e Stoudemire (right). On a side note, the new CBA’s amnesty provision was specifically designed to free teams of contractual errors like Stoudemire’s. However, the Knicks chose to waive Chauncey Billups instead, saving $14.2 million (which they used to commit more money to Chandler’s bumper deal) instead of saving themselves from over $80 million of Stoudemire’s deal. Go figure. Thankfully, the big-money contracts of the Knicks’ under-performing trio come off the books in 2015-16, and they have only $12.6 in committed salary (before factoring Anthony’s potential extension and Tim Hardaway, Jr’s expiring rookie deal). That jump in cap space coincides with several big names potentially hitting free agency. The likes of Kevin Love, LaMarcus Aldridge, Rajon Rondo, Marc Gasol (and potential each of Miami’s big three depending on how their contract negotiations unfold this offseason), will hit the open market, and could be attracted to the bright lights of Madison Square Garden. Rating: 8/15 – next season will be a nightmare for New York’s front office, unless they can move any of their three untradable contracts. However, they will get a fresh run at things the season after, and with a bit of luck they could find themselves courting some of the league’s biggest names. Total: 25/50 – things look pretty bleak for the Knicks over the next few season. Their biggest asset is a superstar who could be jumping ship in the offseason. And even if he does decide to leave, New York has so much salary invested in overpaid big men that they still won’t have any flexibility to improve. They have only one significant draft pick in the foreseeable future and have missed the boat on the loaded class of 2014. Jackson will be their pipe dream saviour, but it is unlikely he will return to the sidelines at his age. New York has three chances to make a quick return to relevance that need to all fall their way over the next few seasons. They need to lock Anthony into a long term contract, but need him to sacrifice some salary to give them flexibility heading forward. They need to hope one of the star college prospects of 2014 choose to stay in school and then fall into their lap in 2015. And finally, they need to get even luckier in the impending free agent mad rush of 2015 and hope they can secure another superstar. It is a very slim possibility, but it is still there. There is always hope, but the next few years will be a bumpy ride for Knicks fans. Check out our other Can We Fix It? articles here.